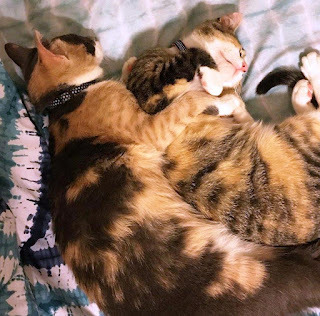 Anthony's mother adopted two kittens from the same litter, but Anthony and his wife, Lindsey, decided to adopt one of them from her. Both kittens were calico and looked very much alike. Later, Anthony's mother told them that she was not able to give her remaining kitten enough attention, so they took it too and named her Pumpkin. Pumpkin and her litter-mate sister settled in very nicely together in their home with Anthony and Lindsey. 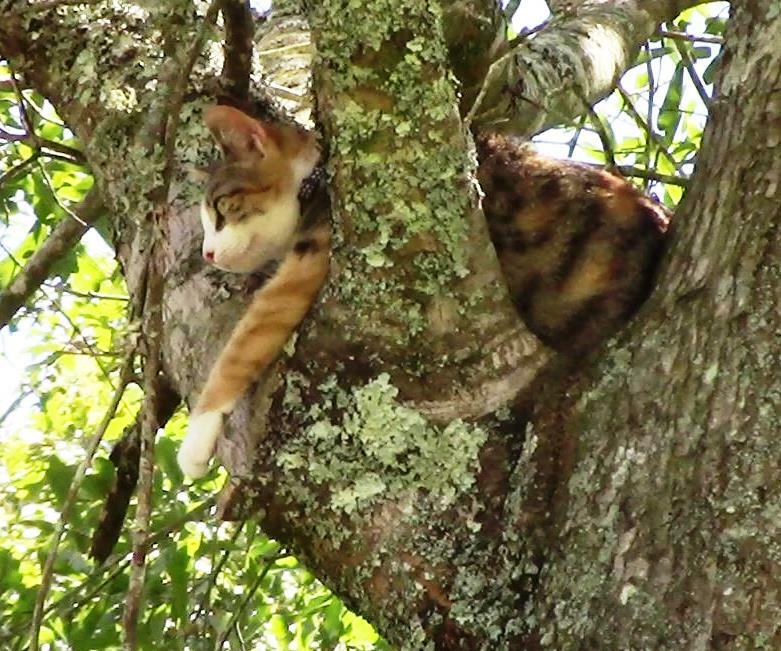 We're not sure what happened, but for some reason, Pumpkin climbed up the tree in her front yard and got stuck there. She had been there for only a few hours, but Anthony and Lindsey could tell she was stuck, and they were not going to allow her to stay up there any longer than necessary. So they called the fire department, and they referred them to me. I went out there as soon as I could. 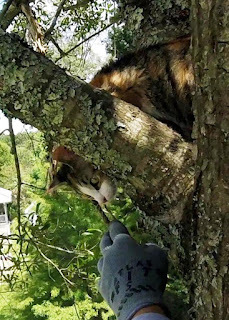 I found Pumpkin about 20 feet high on the first limb of the tree, and she was calling out to us below. 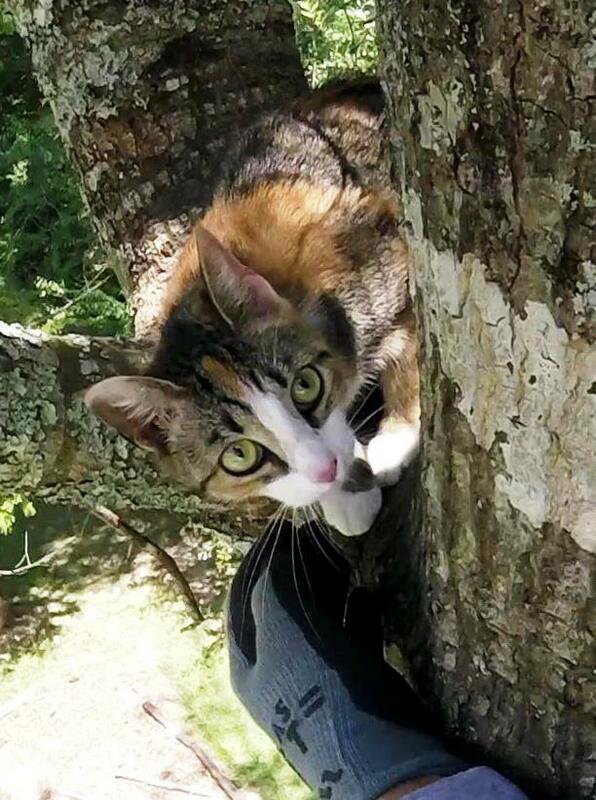 She was only nine-months old and as cute as she could be. As many times as I have seen a cat stuck in a tree, it still strikes me as a pitiful sight. I climbed up to her slowly while gauging her reaction, and she seemed fine. In fact, she looked very relaxed. Once I was close to her, I held my hand out to her, and she sniffed it and let me pet her. I came up a little closer, and she remained perfectly calm. 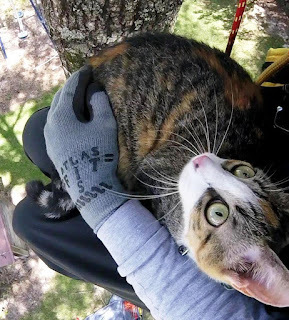 This is a sweet, trusting little girl, and it was a joy to make friends with her there. It seemed perfectly natural to me that she would step into my lap. 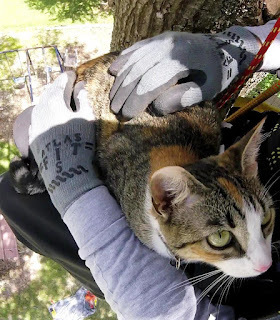 I rarely bring a cat down out of a tree in my lap, but that seemed like a real possibility this time. I went over my mental checklist of requirements for a lap descent. She was very relaxed -- check. The descent would be short and obstacle-free -- check. If she jumps out of my lap, she is familiar with the territory and knows how to go home -- check. Let's do it. I pulled myself into position to allow her to step onto my lap, and she knew exactly what to do without any encouragement. She stepped onto my lap and settled in like we were old friends. She sure knows how to melt my heart. I wanted to take her home with me. 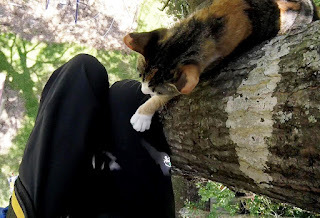 I descended very slowly, and Pumpkin remained very relaxed all the way to the ground. 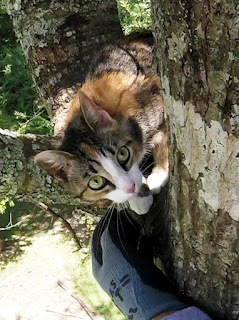 Once we got close, she jumped down and ran toward the house. Anthony picked her up and handed her to Lindsey who took her inside. 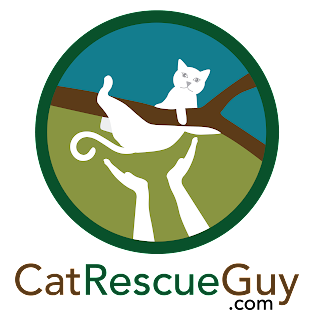 They were both very relieved and grateful, but I was equally grateful for the joy of such an easy rescue of a super sweet kitty. That's my favorite kind of rescue. Later, Anthony sent me this picture of Pumpkin sleeping peacefully while curled up with her sister. Sleep well, Pumpkin, and if you ever decide to leave them, I would love to have you.